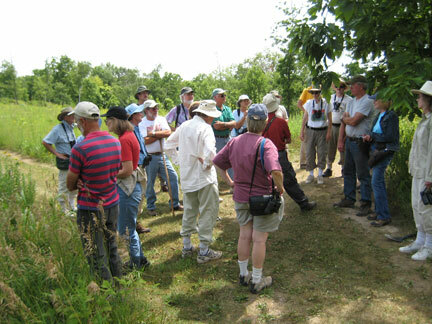 The Annual Labor Day field trip at Pleasant Valley Conservancy will be held this Monday, Sept. 3, from 1-4 PM. This is an excellent time to see the prairie in its late-summer glory. Despite the drought, most of the areas are in surprisingly good shape. 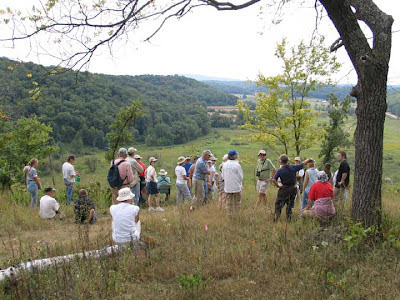 Folks from the 2005 field trip enjoying the view from the ridge-top savanna. This trip is open to anyone without charge. Although it follows mowed trails, there is considerable hill climbing involved. Where to meet: navigate to Fire number 4609 Pleasant Valley Road, Black Earth, WI 53515. Park at the side of the road near the driveway. For more details, access the Pleasant Valley Conservancy web site. This year at the Prairie Enthusiasts annual meeting in February Kathie and I donated to the Silent Auction a "free" field trip . As it happened, Jack Kussmaul, President of TPE, won the prize and yesterday he claimed it. He set this up so that the trip was part of a day-long event for a group of his friends. Kathie and I were delighted to lead this trip, and everyone seemed to enjoy it. The group got the full treatment, from the Valley Prairie, through the Pocket Prairie, White Oak Savanna, Ridge top savanna, and then downhill through the south slope and back to the beginning, where juice and cookies were served. Following the Diagonal Trail across the south slope. Typical open-grown bur oaks above. Among other things, we had a chance to discuss conservation easements and how they can be handled for the benefit of both the landowner and TPE. This has turned out to be a great year for prairie dock (Silphium terebinthenaceum), which is interesting considering the continuing drought. All our prairie dock sites are very lush, and the flower stalks are quite tall. 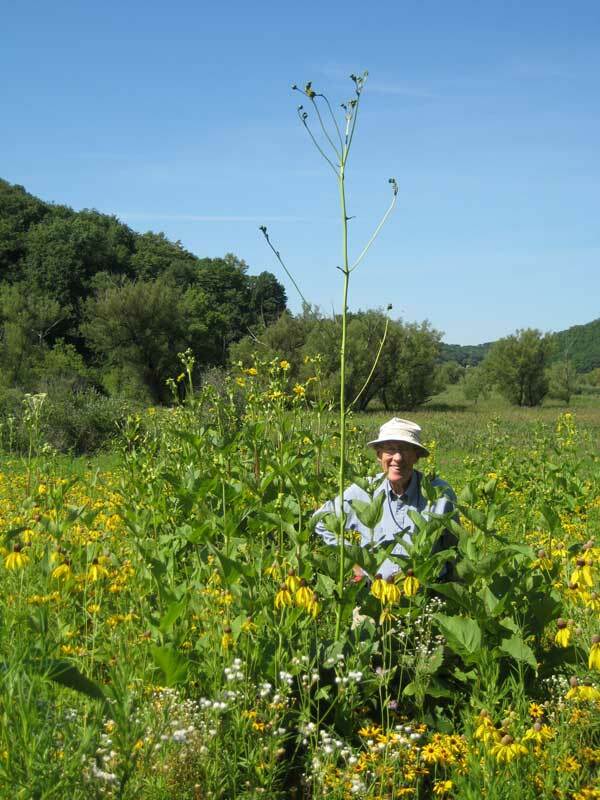 Prairie dock flower stalk towers over this 6 ft 3 inch person. At Pleasant Valley Conservancy we have very lush plants in the Barn, Crane, Pocket, Ridge, and Valley prairies, all of which have been planted. We also have tall flowering stalks in both Toby's Prairie and our Unit 11A savanna, neither of which we planted. Even this isn't all. There are two prairie dock patches that are hardly ever seen but are flourishing this year along the south side of U.S. 14 beteen Stagecoach Road and Twin Valley Road. Although it takes quite a few years for prairie dock to become established (our plants first flowered in the 5th or 6th years after planting), once firmly in place they are long lived. Our wetland plants continue to thrive. One of my favorites is cardinal flower (Lobelia cardinalis; C value of 7). Not too hard to know where that name came from! 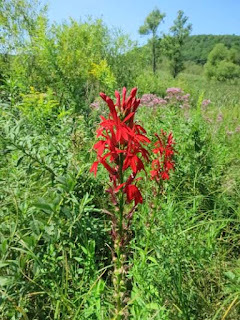 Although the cardinal flower is a wetland plant, we first saw it at Pleasant Valley Conservancy in our White Oak Savanna. It was the year we cleared that savanna, and a single plant in full bloom appeared. Of course, we never saw it there again. A related species is great blue lobelia (Lobelia siphilitica; C value of 5), which is also monocarpic but a lot more common than cardinal flower. We almost always see blue lobelia where we have cardinal flower (but not the other way around). This year we have lots of this lobelia. All three of these species are native to Pleasant Valley Conservancy, and thrive in the wetland without any help from us (except for the occasional burn). We do collect seed and plant it in some of our wet mesic prairies (such as the Barn, Crane, and Valley Prairies), but they generally seem to do better on their own than with our help. Right now, the wetland adjacent to the Crane Prairie is lush with these species. 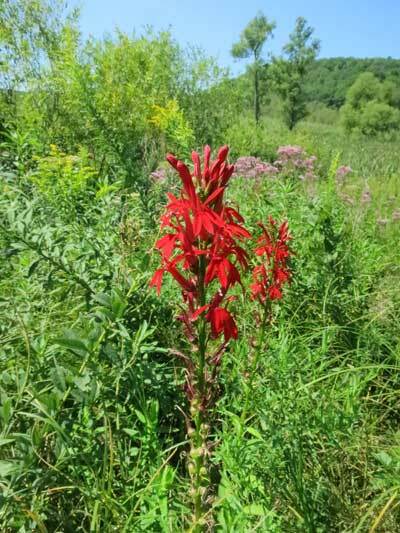 For several years we had cardinal flower in the Crane Prairie but this year it is absent, although the site where the above photo was taken was less than 10 feet from the Crane. Who knows? 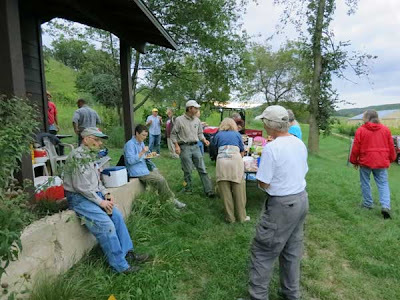 The Annual Labor Day field trip at Pleasant Valley Conservancy will be held Monday Sept. 3 from 1-4 PM. This is a great time to see the prairies and savannas in their full glory. The recent rains have brought things back nicely. We may even be able to collect some seeds! 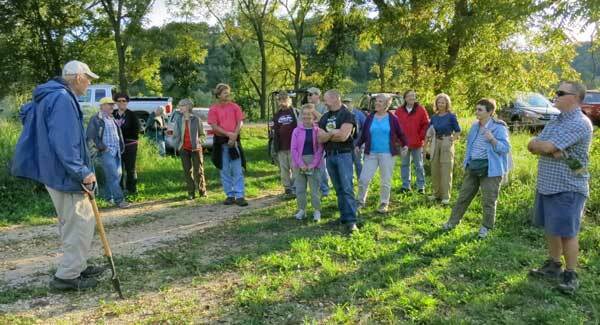 Thursday evening we had a nice visit from folks of the Blue Mounds Area Project (BMAP). This is a community-based organization that seeks to "inspire, inform and empower private landowners in the Southwestern Wisconsin region to enjoy, protect and restore native biodiversity and ecosystem health." The Project has assisted over 130 landowners in Southwest Wisconsin to manage and restore their properties for native species. Kathie and I were charter members of this organization, which was founded by Brian Pruka in 1996. In fact, we worked with Brian even before BMAP was formed, since he provided the first management plan for what would become Pleasant Valley Conservancy. Brian also provided us with the first plant species list for PVC, an especially valuable restoration tool since it was prepared before any new planting or other restoration work had been done. 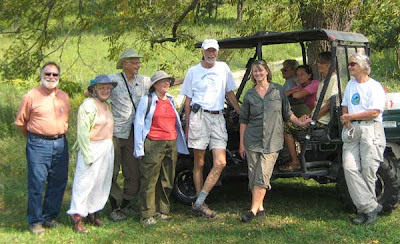 Pruka's original concept, which still drives BMAP, was to create a membership organization involving private landowners. The Project would provide a knowledgeable ecologist (somewhat like an "extension" agent) to work directly with landowners on a one-to-one basis. The Project was initially funded by a grant from the Wisconsin Environmental Education Board to Community Conservation Consultants, and through the years has had other substantial grants. The Project is now an independent tax-deductible entity with a board of directors. During the first year Pruka consulted with over 20 landowners. Each consultation included walking the land with the owners and pointing out specific plants, animals and natural communities which occurred on the lands visited. Discussions included how a landowner could enhance some of these desired species or habitats. A written report was provided which included recommendations for restoration work. When Pruka moved on, ecologist Bob Wernerehl took over and greatly expanded the work with private landowners. The Project has continued to follow this model and every growing season employs an ecologist. Other major activities of the Project include educational lectures in the winter, and visits to the land of members. It was in this latter category that last night's visit took place. Kathie led the group on a tour through the upper savanna area. Fortunately, enough rain had fallen over the past few weeks (including 0.5" Thursday morning) so that the vegetation looked nice and lush. After the tour, the group enjoyed an excellent potluck dinner at our small field station/cabin. Now that we have the beavers under control (thanks to Lon! 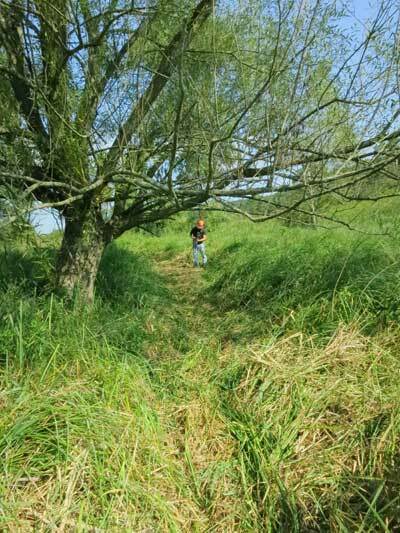 ), we have made a new wetland trail that gives access to the creek, springs, sedge meadow, and cattail area. This trail is accessed from the end of the boardwalk. Making this trail involved a lot of brush cutter work, as the vegetation is pretty high. 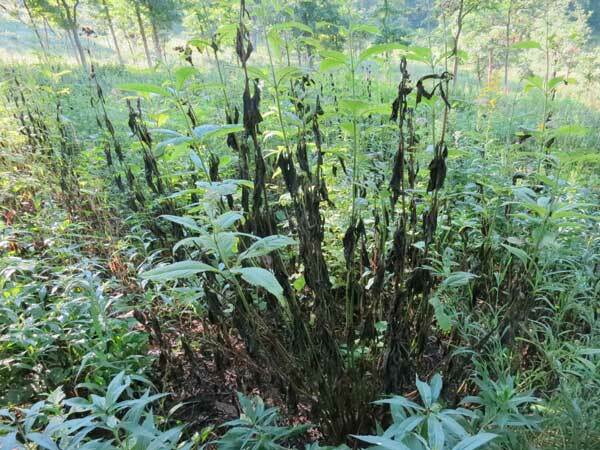 (The drought, of course, has had little effect on the growth of the wetland vegetation.) The route of the trail had been worked out last year, and we had actually started to mow it when the beavers moved in. It has taken us a year to get rid of them. Reports are that they have moved upstream, near where Ryan Creek enters East Blue Mounds Creek. Hopefully, they will stay there, but if they return we are determined to get rid of them immediately. During this summer our boardwalk got heavily overgrown. 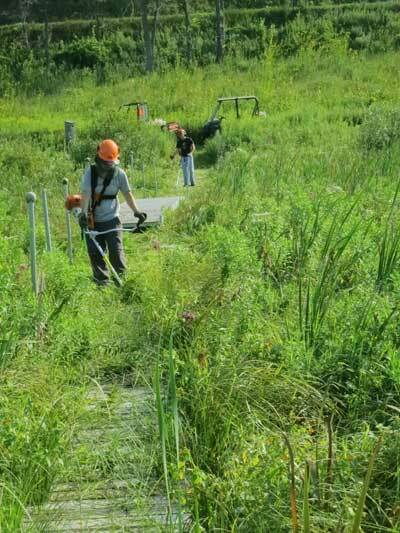 Although accessible, it was almost invisible, so it was mowed first. It took two brush cutters (Amanda and Dan) to clear it out, followed by a leaf blower (Susan) to get rid of all the cut vegetation. The new trail starts at the end of the boardwalk and follows the creek upstream. Marking this trail for the brushcutters was a major undertaking in itself, which Kathie and Susan carried out. We had laid out the route last year (before the beavers) but because of heavy plant growth it had become almost invisible. The route was marked with flags (which were removed once the brush cutting was finished). We are excited about recovering our wetland, because it will give us opportunities to study both the vegetation and wildlife. Also, there are patches of reed canary grass out there that need to be controlled. Our wetland ownership is only a small part of the whole wetland in this valley. The burns that U.S. Fish & Wildlife Service have done involved five owners and about 140 acres. Our part of this unit is about 28 acres (as measured by GIS). However, neither the vegetation or wildlife pay any attention to property boundaries! Kathie and I attended the 2012 North American Prairie Conference, which was held at the University of Manitoba, in Winnipeg, Canada in early August. I have submitted a report on this conference to the Prairie Promoter (the newsletter of The Prairie Enthusiasts). 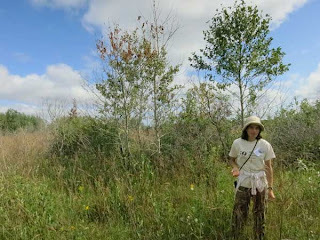 The present blog will deal only with our field trip to the Tall Grass Prairie Preserve in southeastern Manitoba. The Tall Grass Prairie Preserve consists of about 12,000 acres in the southeast corner of Manitoba, just north of the Minnesota line. Although Nature Conservancy of Canada (NCC) has taken the lead in management of the Tall Grass Prairie, the Preserve originated in 1989 through the cooperative efforts of Canada’s Critical Wildlife Habitat Program partners: NCC, Manitoba Naturalist Society, Canadian Wildlife Service, Manitoba Habitat Heritage Corporation, Manitoba Conservation, World Wildlife Fund, and Wildlife Habitat Canada. 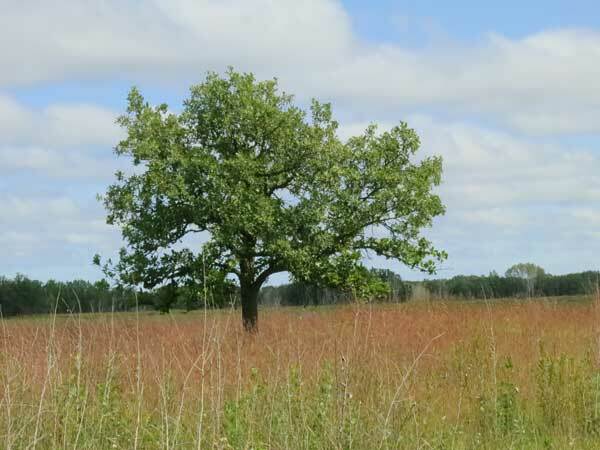 A lone bur oak stands in the middle of a field of Andropogon gerardii. This far north and west, this is the only species of oak that is present. The prairie area here, one of the flattest on the continent, was formed by Glacial Lake Agassiz, which arose from one of the last great glacial movements of the Pleistocene. Flowing through this area is the sluggish Red River of the North. In this area, minimal drainage developed; rivers and streams meander extensively, few lakes occur, and flooding is common. Although most of the flatland has been plowed for agriculture, there are numerous beach ridges and sand deposits that stand a few feet or inches above the surrounding land. Prairie grasses such as big bluestem thrive. Presettlement there were large areas of such tall grass prairie, and it is here that the remnants have been preserved and protected. The habitat alternates between wet and dry, making for a complex vegetation. Strange to see two species of Pedicularis almost side by side, the dry mesic species P. Canadensis on top of a slight sand ridge, and the wet mesic P. lanceolata a few inches away in a swale. The plant species checklist we were given for this area had over 200 species, and this was just the common prairie plants. Noteworthy among this list is the endangered Western Prairie Fringed Orchid (Plantanthera praeclara). The Tall Grass Preserve is the only Canadian location for this attractive plant. Another endangered species is the small white lady slipper orchid (Cypripedium candidum), found in wet meadows in the southern block of the Preserve. Other species considered rare or of special interest include Great Plains Ladies Tresses (Spiranthes magnicamporum), Culver's Root (Veronicastrum virginicum; listed as endangered in Manitoba) Riddell's Goldenrod (Solidago Riddellii), Two-flowered Cynthia (Krigia biflora), Whorled Loosestrife (Lysimachia quadriflora), Whorled Milkwort (Polygala verticillata), and Wild Geranium (Geranium maculatum). Also noteworthy is the rare Poweshiek skipper butterfly, which in Canada is found only within this Preserve. After an hour bus ride we stepped into the middle of the tall grass prairie. Because of the terrain, this area was less suited for agriculture than other locations, and the first settlers avoided it. The Ukraines, an ethnic group that arrived late to Manitoba, were stuck with this land and settled around the area of Tolstoi and Gardenton. The ethnic heritage is still maintained, and there is a fine Ukraine Museum right at the edge of the prairie. Aspen groves such as this one are being controlled by girdling. A large wildfire had swept through this area in the spring, and the vegetation was very lush, with a high diversity of plant species. Without trying hard, our group of knowledgeable botanists easily found 30 or 40 species (no one kept count). 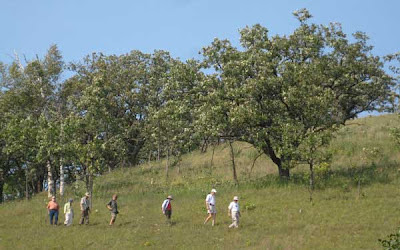 The terrain of this prairie resembled in many ways Faville Grove Sanctuary in Jefferson County. 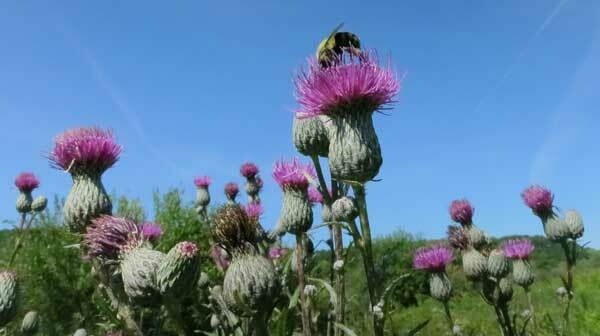 However, a number of species that are quite prevalent at Faville, such as the Silphiums, are completely absent here. Then again, prairie dropseed, prevalent at Faville, is also a signature species here. After a fine lunch served by the Ukrainians, we spent the afternoon learning about the rotational grazing that NCC is carrying out. Grazing is combined with prescribed fire to manage the prairie. Local ranch owners provide the cattle, and NCC takes care of the water supply for the animals. We were shown an installation where water was brought into drinking troughs by means of a pump powered by solar energy. We also had time to visit a new Nature Center that NCC had just opened. 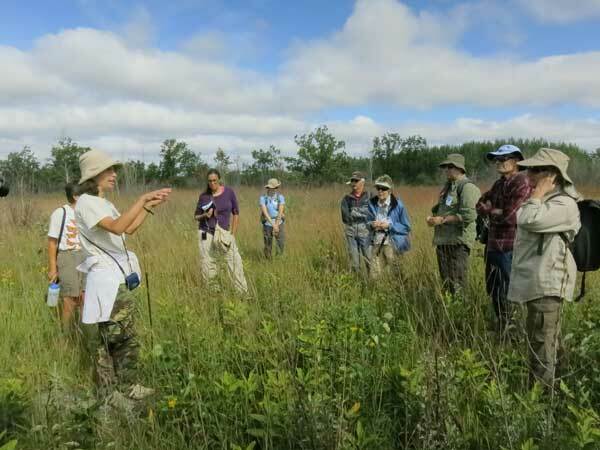 In addition to seeing such nice prairie remnants, we were delighted to talk with so many knowledgeable prairie people. Are drought-killed plants really dead? Eupatorium purpureum patch showing serious effects of this summer's drought. As I have noted in previous posts, the plants in many areas at Pleasant Valley Conservancy have remained surprisingly robust during this year's extended drought. The principal "at-risk" area is the south-facing slope, where little bluestem has been greatly suppressed (although rarely killed yet), and many of the forbs are markedly stunted.The savanna areas are in fair shape, although even here patches are being killed or greatly suppressed. 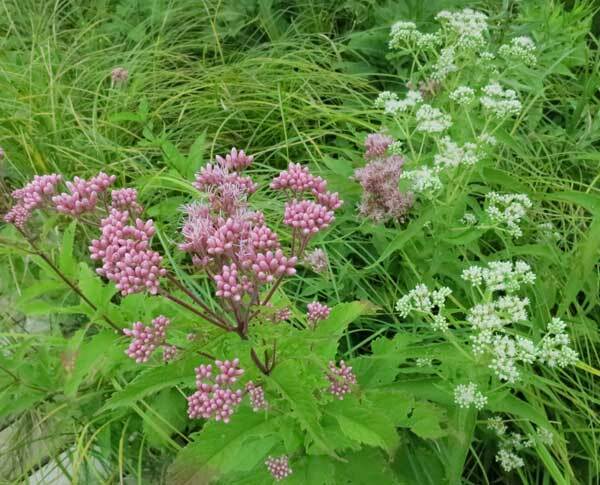 Most populations of woodland Joe Pye weed (Eupatorium purpureum), a common savanna species, still seem OK, but in several areas the plants are crisp and brown. 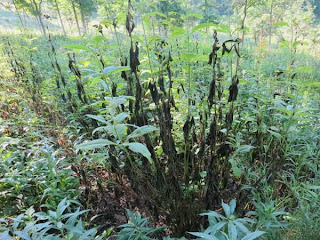 It is not obvious why these particular plant populations appear dead, whereas others remain healthy. Perhaps it reflects a difference in groundwater availability. I was interested to determine whether these dried up plants were really dead, so I dug up a few and looked at their bases. The photo here shows what I found. Despite the fact that the stem and all the leaves of this plant are brown and crisp, a new shoot is arising from the base. The growth of this shoot was probably released when the apical dominance of the stem was abolished. The roots of this plant also look dead, although new root primordia probably are present in the area where the new shoot is growing. I'm not sure whether shoots such as these, arising from "dead" plants, will continue to grow, breaking through the soil surface. Their fate may depend on whether rain will replenish the supply of soil moisture. At least we can say that at this stage, these dead-looking plants still have life in them.